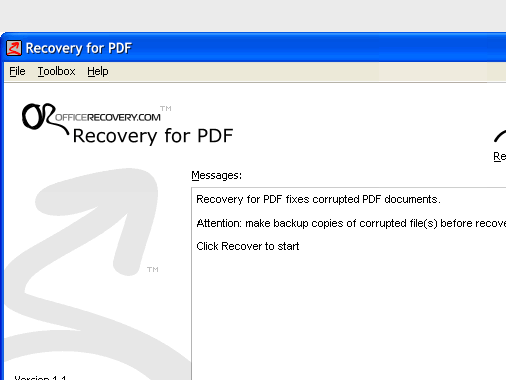 Recovery for PDF is data recovery program for damaged Portable Document Format files (.PDF). Is able to restore PDF objects, such as page tree, cross-reference table, images; interactive objects: links, notes, action performed when clicking on links. Creates a new PDF document. Restores original PDF formatting: fonts, outlines, colors, zoom factor etc. Supports Adobe PDF 1.5 and other versions of format. Easy to use, no special user skills required.